His Serene Highness the Most Reverend Edmond III is the 8th Prince-Abbot of San Luigi in succession to the 1883 foundation of the Abbey-Principality in the Fezzan, and the 6th Mukungu (Prince-Governor) of the Ancient Abbey-Principality of San Luigi (Fizzan) in succession to this title created by the Kingdom of Bunyoro-Kitara in 1885. He holds the additional titles of 2nd Prince of Miensk, Vilna and All Byelorussia; Prince of Gniezno, Volo, Hohenheim, Laç, and of the Holy Roman Empire (in the Imperial Byzantine Amorian Dynasty); Prince (by the Royal Principality of the Upper Region of Hiran, Somalia); Chief Oshodi of Irrua; Duke of Smolensk, Samos, de Resigne, of Saint Cyrille, of Synnada, Fushë-Kuqe, and Feuat; Marquis de Valjevo, of Tiberiopolis, of Mamurras, and of San Giovanni d’Acri; Count de Berville, Count Palatine (of the Imperial Phrygian Amorian Dynasty and the Princely House of Scuro), of Flaviopolis, of San Giovanni d’Acri, of Milot and of Swabia; Baron of Aarburg and of San Giovanni d’Acri; Hereditary Patrician of the Eastern Roman Empire, Datu, etc. He is Prince Grand Master of the San Luigi Orders and the Royal Byelorussian Orders. He was elected to the Prince-Abbacy and related offices by the Supreme Council of San Luigi on 25 August 2011 and confirmed in his title of Mukungu by His Majesty the Omukama of Bunyoro-Kitara on 25 January 2012. He was adopted as son and heir by the late Prince Kermit of Miensk on 1 March 2015 and succeeded him in the Principality of Miensk and related honours upon his death later that month. As a consequence of this legacy, he adopted the additional surname of de Polanie-Patrikios for himself and his heirs. His full name is therefore Edmond John Kersey de Polanie-Patrikios, but he also continues to be known professionally as Professor John Kersey. Following twelve years of lay work within a number of Christian denominations, the future Prince was brought to an eventual realisation that his vocation lay specifically within those movements that had sought to preserve Traditional Catholicism and Western Orthodoxy, and consequently received Holy Orders from a Traditional Catholic bishop, the late Dom Phillip Robert Kemp, OSB(csr). 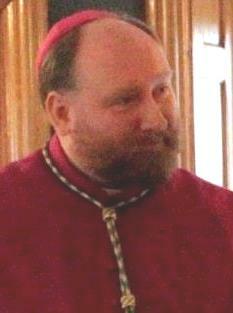 In 2008, he was episcopally consecrated and enthroned for the Apostolic Episcopal Church by Archbishop Bertil Persson, Emeritus Primate of the Apostolic Episcopal Church and the Order of Corporate Reunion (acting on a mandate from the Primate of the Apostolic Episcopal Church), assisted by other bishops from the Orthodox and Continuing Anglican traditions. Since then he has served as a bishop in the Apostolic Episcopal Church (founded 1925), becoming that church’s fifth Primate in 2015, and from 2018 also as Provincial for Europe of the Order of Christ Our Most Holy Redeemer and Heavenly King (founded 1901). He is 114th in Apostolic Succession from the Apostle St Thomas through the Chaldean Catholic (Uniate) succession and 137th in Apostolic Succession from the Apostle St Peter through the Syrian-Orthodox Antiochian succession (263rd through the Petrine succession via the Roman Catholic Church). He is also in succession from the Apostles St James the Less, St Mark the Evangelist and St Andrew. As an educationalist, he is Chancellor of the Western Orthodox University (Commonwealth of Dominica), Chancellor of European-American University (Kingdom of Bunyoro-Kitara), and is also a Full Professor in the International Program of the Universidad Empresarial de Costa Rica, having wide previous experience in teaching and educational consultancy. His recent books, all of which are published by European-American University Press, include The Radical Traditionalist Today (2015), Joseph-René Vilatte (1854-1929): Some Aspects of his Life, Work and Succession (2011), Arnold Harris Mathew and the Old Catholic Movement in England 1908-52 (2010), and The University Outside State Control (2009), the first to address its controversial topic in depth. He is also an award-winning concert pianist, having recorded over one hundred CDs for his own record label Romantic Discoveries Recordings, including first recordings of works by Beethoven, Alkan, Mendelssohn and many others. He is a Privy Counsellor, Honorary Family Member, Noble and Peer of the Imperial Byzantine Amorian Dynasty, which dynasty was fully recognized by judgements of the Italian courts (under King Victor Emmanuel III) in 1945. As such, by right of family membership and the family laws of 1522, he is a Knight Grand Cross of Honour (thereby of Justice) in the Sacro Imperiale Ordine Costantiniano Nemagnico di Santo Stefano of the Imperial e Real Casa Capone Nemagna Paleologo, and Count Palatine (cf. judgement of 18 July 1945 (Luogotenenza del Regno), Tribunale Civile di Napoli, Quarta Sezione, filed on July 28, 1945 and registered in Naples, Office of Judicial Acts, on July 30, 1945: section 4). From his cousin the Head of the Imperial House, he has received the Hereditary Grand Cross of the Ordine Internazionale delle Legion d’Onore dell’Immacolata, Hereditary Knight of Justice of the Serenissimo Militare (e Nobiliare) Ordine di San Marco, Hereditary Grand Cross of Justice with Collar of the Order of the Knights of St Catherine of Sinai, Hereditary Grand Cross of Justice of the Sacro Sovrano Imperiale Militare Ordine Costantiniano di San Giorgio della Milizia Aurata d’Oriente della Imperiale e Real Casa Lascaris Ventimiglia Valperga Sanmartino, Hereditary Grand Collar of Justice of the Sovrano Costantiniano Ordine di San Giorgio, già detto Ordine Costantiniano-Amoriano dei Cavalieri Aurati d’Oriente (Dinastico d’ Amorio); Hereditary Grand Collar of Justice of the Ordine Militare et Ospitaliere di San Giovanni d’Acri e San Tommaso; Hereditary Grand Collar of Justice of the Ordine Militare e Ospedaliero di Santa Maria di Betlemme; Hereditary Grand Collar of Justice of the (Ordine del) Cingolo – alias Cingolo Militare (Dinastico d’Amorio), and Hereditary Grand Collar of Justice of the Ordre Équestre de Saint George de Bourgogne, together with numerous armigerous rights. From H.I.R.H. Prince don Ezra Annibale Foscari Widmann Rezzonico, Head of the Imperial House of Leopardi of Constantinople, he has received the titles of Prince of Hierapolis, Duke of Mardin, Count of Pontus, and Byzantine Patrician and Count Palatine of the Justinian-Heraclian Dynasty of Tomasi (subsequently Tomassini)-Paternò Leopardi of Constantinople. He is an Honorary Cousin, Peer and Privy Counsellor of Prince don Ezra. He is also a Knight Grand Cross of Justice with Collar of all the present and future Orders of the Dynasty, currently the Ordine Imperiale della Corona Eracliana di Costantinopoli, the Ordine della Guardia d’Onore di Santa Sofia, and the Ordine Imperiale Costantiniano di San Giorgio. From H.S.H. Prince Orazio Scuro, hereditary Prince of Arbër and Count and Baron of Albania etc., he has received the titles of Prince of Laç, Duke of Fushë-Kuqe, Marquis of Mamurras, Count of Milot, and Count Palatine of the Princely House of Scuro, and is an Honorary Cousin, Peer and Privy Counsellor of Prince Orazio. 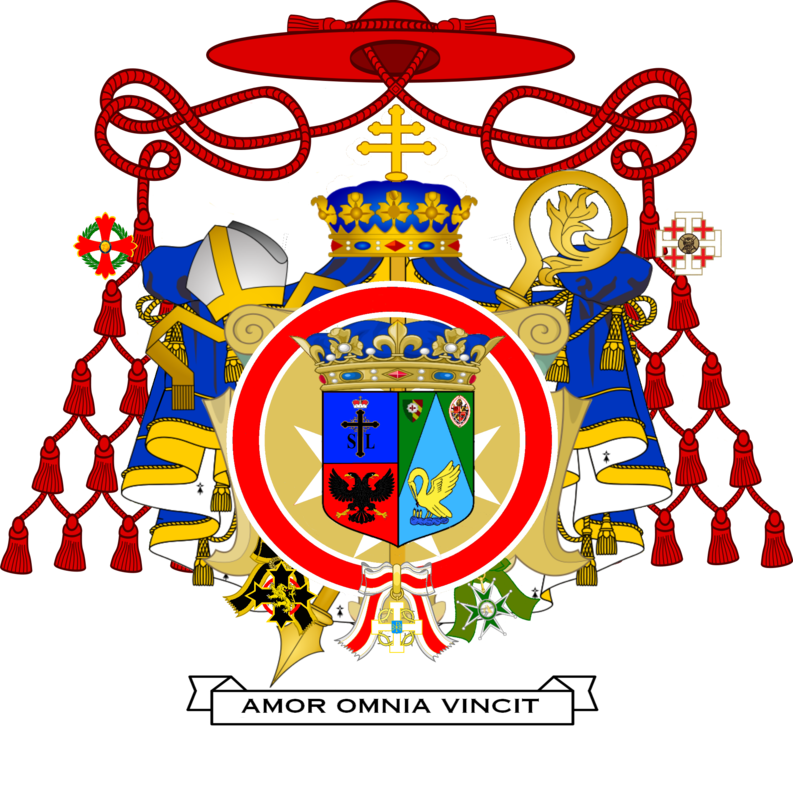 He is also Knight Grand Cross of Justice with Collar of the Order of the Eagle of Albania, and serves as Prior and High Protector of the Order. In addition he has received the highest distinction of “Perpetuum” (Grand Cross) in the Ordinis Venerabilis Sodalicii Mariae Ss. Boni Consilii Mortis et Misericordiae, Città di Castello, Italy, which is probably the oldest religious brotherhood in continuous existence today (founded c.990AD). He has been awarded Knighthood of the Order of the Precious Blood in the Old Roman Catholic Church in America. In the Royal Order of St Stanislaus he has received the Gold Cross of Merit and Medal of the Wrocław Commandery. He was awarded an Honorary Datuship from the Sultanate of Baloi, Philippines, in 2015, and the title of Prince by the Royal Principality of the Upper Region of Hiran, Somalia, in 2017. He received the honorary rank of Colonel in the Hungarian National Guard (1956), together with its highest award, the Hungarian National Guard Grand Star (awarded with the support of the Hungarian Ministry of Defence) and the Medal of the Anniversary of the 1956 Revolution. He was admitted as a Knight Grand Cross of the Order of St George the Martyr (Hungary) in 2017 and in the same year was honoured by the Order of the Calamian Star of Peace (Coron Island, Philippines) with the title of Grand Commander, being subsequently appointed Grand Prior for the Order in the UK. In 2012 he was awarded the Verdienstkreuz in Gold from the Confraternitas Oecumenica Sancti Sepulcri Hierosolymitani, Bavaria, Germany, of which he is also an Honorary Brother and Prefect for Great Britain, in recognition of his achievements in Alternative Education, Music and Theology and his humanitarian efforts for Africa. Subsequently he has received the Medal “Pro Probitas” in gold (Class I), the highest award of the Collegium Heraldicum Concordiae, Poland, the Jerusalem Cross and Medal of the Regent of the Union of the Polish Monarchists Association, the Commemorative Cross for the 150th Anniversary of Marshal Józef Piłsudski, and the Grosses Verdienstkreuz in Silber of the Freundeskreis Hoch- und Deutschmeister, Mannheim/Baden, Germany. He has received honours from Polish military and veterans’ societies, including the Cross of Merit of the Polish Society of War Veterans and Former Political Prisoners, the Badge of Honor – Cross of Merit for organization of soldiers of the Home Army Uprising Special Forces “Jerzyki” (“Swifts”), and the Brown Badge for merit awarded by the Polish Paratroopers Union in Warsaw. He serves as Royal Protector and Member of Sovereign Council of the Regency of Lomar, an international humanitarian organisation. He has been honoured by the Governors of four States of the United States of America, being a Colonel of the Commonwealth of Kentucky, an Admiral of the Great State of Nebraska, Lieutenant Colonel Aide de Camp Governor’s Staff of the State of Georgia and an Honorary Texan. In 2014, he received the President’s Lifetime Achievement Award from President Obama in recognition of his commitment to volunteer service. He holds several academic and honorary degrees from British and overseas universities, has received a number of honorary fellowships from musical and other institutions, and is a Fellow of the Central School of Religion, USA. In 2016 he was elected a Pontifical Academician, becoming an Honorary Academician of the Pontificia Accademia Tiberina in Rome, and in 2017 was elected an Academician of Honor of the Norman Academy, which is headquartered in Florida, USA, and recognized by the government of The Gambia. He has been awarded the distinction of Academic Knight of Verbano by the International Order “Greci-Marino” – Academic Order of Verbano, Italy. 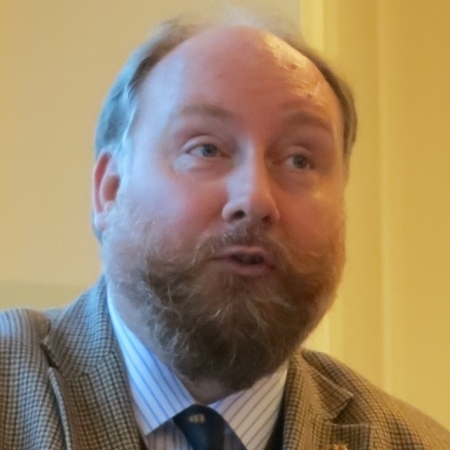 His personal website at www.johnkersey.org gives further details of his publications and his work as a historian and musician.